NOTE From Samantha: Over many years of research as to what we should and should not be putting into our body I have come to the realization that generally speaking it is almost impossible to find all we need in foods these days due to the ‘factory farming’ methods used that depletes the soil of most minerals. Hence I search the world looking for products that will fill the gaps we have in our diet and supply our body with all it needs to function optimally. One of the products I have found to do this is PURATAE Super-food. Puratae is a supplement that provides over 14 supplements in one that would not only provide your vitamins and minerals, but also support a healthy gut, natural energy, antioxidant cell protection, and plant-based protein to maintain lean mass. With the nutrient content of 12-14 servings of fruits and vegetables, it’s the absolute best way to start your day to give your nutrition the boost it needs to put you on the top of your game. Antioxidants provide cell protection and counteract the impact of free radicals (which are unstable molecules that can cause damage to your cells, disease, and speed up the aging process). PURE SUPERFOOD provides the antioxidant equivalent of 12-14 servings of fruits and vegetables. Your lean muscle is precious as it is your primary metabolic engine and provides the tone for your body. Adequate protein and nutrients daily are vital to maintain this lean mass. To fuel your lean tissues we’ve chosen plant-based Pea Protein and Spirulina for they’re low-allergen, high-absorption and amazing nutrient content. 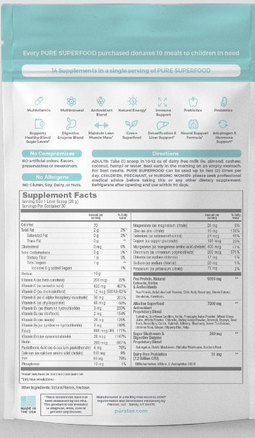 Our Vitamins and Mineral content is a key factor that sets our product apart from the rest. Vitamins and minerals are essential for the human body to function correctly. For a strong immune system and a well-functioning nervous system, you must have the perfect balance of vitamins and minerals in your body. The body requires the right amount of nutrients and protein to stabilize the blood sugar and properly use stored energy for fuel. A body that is deficient in certain nutrients will crave in an attempt to have an increase in the area of deficiency or to try and stabilize the blood sugar. Our blend was designed to improve insulin secretion from the pancreas while also improving the absorption of glucose in the muscle tissue. 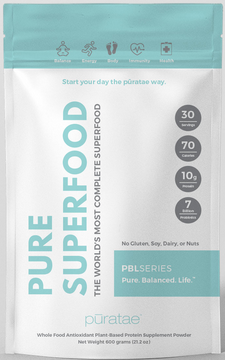 PURE SUPERFOOD provides support in blood sugar stabilization and energy production. It was designed to stabilize and balance the blood sugar, while providing your body the right combination of vitamins and essential minerals to function optimally. The gut is known as the second brain of the body and is in certain vital for nutrient absorption. 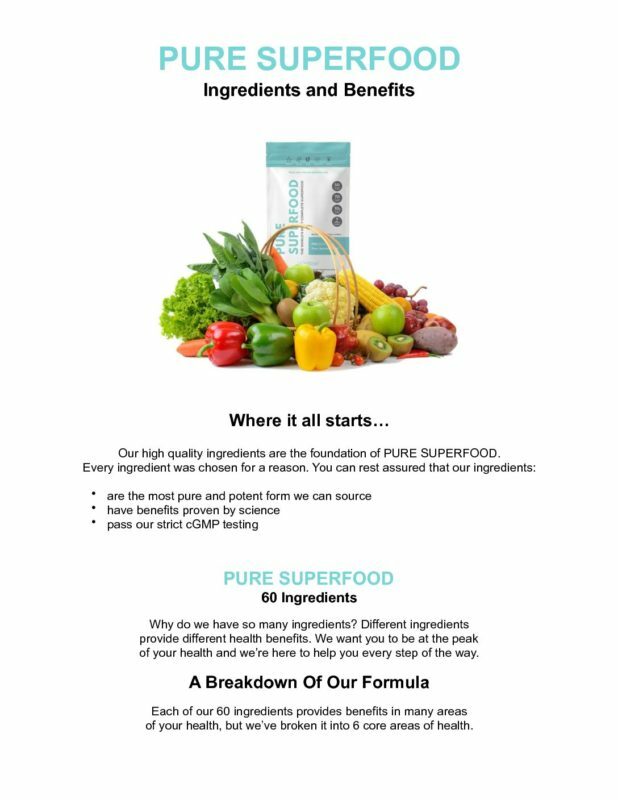 PURE SUPERFOOD contains naturally occurring enzymes the right the digestive process and also to increase nutrient absorption. A healthy liver is vital to remove toxins from the body. And pre and properly are vital for gut flora health and the immune system support. Adaptogens help the body resist stressors of all kinds. They can also help with physical and mental fatigue and to normalize sleep patterns. Also vital to hormone support is a healthy gut for the proper uptake and absorption of essential vitamins and minerals. Pre and Probiotics can influence our hormones in a variety of important ways including metabolizing and recycling hormones in the body and have a positive and balancing effect on Estrogen, Insulin, Leptin, Melatonin, Oxytocin, and Testosterone (among others). PURE SUPERFOOD supports memory, cognition and the nervous system to support healthy hormone production.